Introduction: Sjogren's syndrome (SS) is a systemic autoimmune disease that apart from involving the exocrine glands can affect any organ. Involvement of the peripheral nervous system results in a wide spectrum of neuropathic manifestations. Objective: To evaluate the clinico-electrophysiological patterns as well as pathological characteristics of neuropathy in SS patients presenting to a neuromuscular clinic in a tertiary hospital from South India. Materials and Methods: This is a retrospective study from the Departments of Neurology, Rheumatology, and Pathology from Nizam's Institute of Medical Sciences. Twenty-one patients with the diagnosis of SS and peripheral neuropathy, seen between 2010 and 2016 were analyzed. Clinical records, conventional nerve conduction studies, and lip and nerve biopsy reports were collected. Results: Twenty one patients with SS had associated neuropathy. Female-to-male ratio was 2:1. In 14 (66.7%) patients, neuropathy was the initial manifestation, while in 4 (20%), exocrinopathy preceded neuropathy. The patterns of neuropathy included mononeuropathy multiplex (MNM) in 7 patients (30%), ganglionopathy in 4 (20%), length-dependant trigeminal autonomic neuropathy, and chronic inflammatory demyelinating polyradiculoneuropathy (CIDP) in 2 (10%), and cranial neuropathy in 1 (10%). 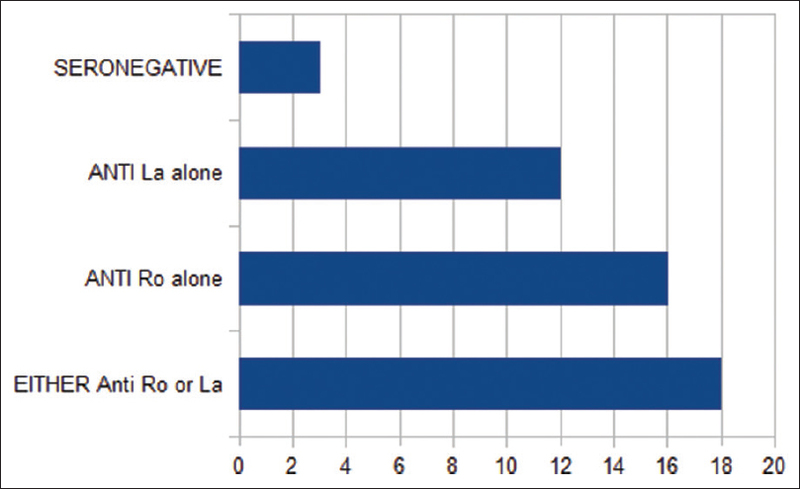 Eighteen (86%) were seropositive with either anti Ro/SS-A or anti La/SS-B antibodies. Schirmer's test was positive in 13 (61.9%) patients. Nerve biopsy showed vasculitis in 5 patients and demyelinating and axonopathy in 2 patients each. Conclusions: We conclude that neuropathy is frequently the initial presentation of SS. MNM is the most common pattern followed by ganglionopathy. The pattern of neuropathy helps in arriving at the diagnosis of SS. Serology is a useful initial laboratory test. However,confirmation of SS is not by mere serology. Schirmer's test and lip biopsy are equally essential for the diagnosis, especially in seronegative patients when the clinical index of suspicion is high. Key Message: Neuropathy is frequently the initial presentation of Sjogern′s syndrome. The most common phenotypic pattern is mononeuropathy multiplex followed by ganglionopathy/non-length dependant neuropathy. The pattern of neuropathy, serology, confirmation of the sicca syndrome by meticulous clinical evaluation and noninvasive functional tests followed by lip biopsy all help in establishing the diagnosis of Sjogren′s syndrome. Sjogren's syndrome (SS) mainly affects exocrine glands and is characterized by dry eyes and dry mouth. Among the extraglandular manifestations, involvement of the peripheral nervous system (PNS) is the most common. A wide spectrum of neurological manifestations that include both the central and the peripheral nervous system has been reported. Prevalence of neurological manifestations in SS varies widely from 10 to 60%, with pure or predominantly sensory polyneuropathy (e.g., sensory ataxic or small fibre sensory painful neuropathy) as the most common, to the less common MNM. Sensory symptoms without substantial motor involvement are observed predominantly in sensory ataxic, painful sensory, trigeminal, and autonomic neuropathies. On the contrary, motor impairment is more apparent in multiple mononeuropathy, multiple cranial neuropathy, and radiculoneuropathy. SS-associated sensory neuropathy is often the presenting feature of SS. The clinicopathological features of neuropathies associated with SS and the therapeutic response to immunotherapy are highly variable. Hence, the classification of neuropathy is important from a therapeutic viewpoint. In this study, we analyzed the clinicopathological and electrophysiological features of SS-associated neuropathy and determined the range of clinical presentations. Case records of all outpatient and inpatient services from Neurology, Rheumatology, and Pathology specialities between 2010 and 2016 were reviewed and patients sufferiing from SS noted. Patients fulfilling the American College of Rheumatology [ACR]-European League against Rheumatism [EULAR] classification criteria for SS were identified. Based on this criteria, the patients were either anti-SSA/Ro antibody positive or had focal lymphocytic sialadenitis with a focus score of ≥1 foci/4 mm2 (which scored 3 each); an abnormal ocular staining score of ≥5, Schirmer's test result of more than 5 mm/5 min, and an unstimulated salivary flow rate of ≥0.1 ml/min, each scoring 1. Individuals with signs and/or symptoms suggestive of SS who have a total score of ≥4 for the above items met the criteria for primary SS. The case records were studied and the data pertaining to the demographic and clinical profile of SS patients with peripheral neuropathy were obtained. Clinical details were recorded on a spreadsheet. Data included detailed description of their complaints, onset of symptom, whether the manifestation was a neuropathy or an exocrinopathy, the duration of complaints, other system involvement, and the treatment received. Neurological complaints of motor and sensory symptom onset, progression and distribution of symptoms, and cranial nerve manifestations were recorded. General physical findings included a search for dry eyes /dry mouth, the presence of a thyroid swelling, thickened nerves, and evidence of arthritis and skin lesions. Data on the evidence of autonomic disturbances including the presence of urinary disturbances (frequency, urgency or retention of urine), constipation or nocturnal diarrhoea, sweating abnormalities (anhydrosis or hyperhydrosis), presence of pupillary abnormalities (Adie's pupil, elliptical pupils, or anisocoria), orthostatic hypotension (fall of systolic blood pressure (SBP) >30 mmHg from supine position), or orthostatic tachycardia was noted. Cranial nerve abnormalities, Medical Research Council power scale, and sensory maps were collected. Schirmer's test positivity in patients was documented. Data on nerve conduction study were obtained. Autonomic testing was done among patients with dysautonomia. A diagnosis of neuronopathy/ganglionopathy was made based on significant kinaesthetic manifestations, sensory ataxia without motor involvement, and preserved motor conduction with abnormal sensory conduction abnormalities. Motor nerve conduction was studied by assessing the upper limb and lower limb motor conduction including the assessment of distal latency, compound motor action potential, F wave latency, and conduction velocities. Sensory nerves were tested for conduction velocity and amplitude in the median, ulnar, and sural nerves. All patients underwent Schirmer's test; and, less than 5 mm wetting of the filter paper was taken to be significant enough to suggest a low basal tear production. The cumulative analysis of findings on history, examination, and electrophysiology aided in determining the type of neuropathy. The histology reports of the harvested biopsy were collected in patients who underwent either a lip or nerve biopsy based on the discretion of the treating neurologist. Serological tests included biochemistry, hematology, serum B12 level, serum folate level, T3, T4, thyroid stimulating hormone level, and the vasculitic profile (antinuclear antibody (ANA), anti-double stranded deoxyribose nucleic acid (dsDNA), immunoglobulin M rheumatoid factor (IgM RF), anti Ro/SS-A and anti La/SS-B antibodies, and Scl antibodies). Those patients who were seropositive for either Ro/SS-A or La/SS-B antibodies or for Schirmer's test and those with a high clinical index of SS underwent a lip biopsy. Histological evidence of the diagnosis was based on chronic lymphocytic sialadenitis on lip biopsy. In total, 21 patients were identified to have a neuropathy due to SS. Majority (20) had primary SS and one patient had secondary SS associated with scleroderma. Fourteen patients were females and 7 were males (the female: male ratio = 2:1). The mean age of onset was 40 years (range: 16–70 years). The onset of clinical manifestation was acute in 8 and insidious in 13 patients. The course of illness was gradually progressive in 16, with remission and relapses in 2, was static in 2, and with a step-wise progression in 1 patient. Out of 21 patients with SS, not all had neuropathy as the initial presenting symptom. Fourteen patients (66.7%) presented with neuropathy that on work up turned out to be SS, while 4 patients had an exocrinopathy in the form of sicca syndrome that evolved into a neuropathy later in the course. Two patients had constitutional symptoms of myalgias, while one patient had skin manifestations in the form of scleroderma as the initial symptom that progressed and evolved into the neuropathy of SS. 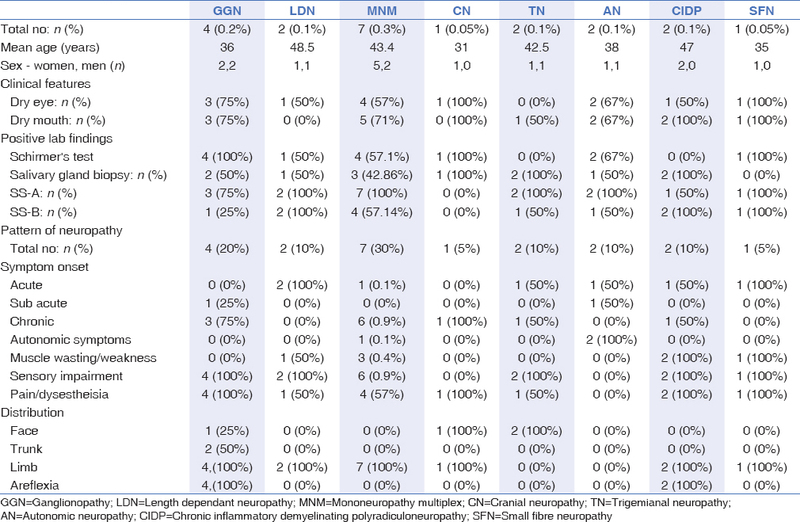 The phenotypic pattern of neuropathy [Table 1] was mononeuritis multiplex in 7 (30%), ganglionopathy with sensory ataxia in 4 (20%), trigeminal neuropathy in 2 (10%), length-dependant sensorimotor neuropathy in 2 (10%), and of the CIDP pattern in 2 (10%) patients. Autonomic neuropathy (postural hypotension and focal hyperhidrosis) plus peripheral neuropathy was seen in 2 (10%) patients, cranial neuropathy in 1 (5%) patient who had sensorineural hearing loss with optic neuropathy, and painful small fibre neuropathy in 1 (5%) patient. Sixteen patients tested positive with either Ro/SS-A antibodies while 2 were La/SS-B antibody positive [Figure 1]. Of them, 3 were also positive for anti-ds DNA, Scl-70, and IgM rheumatoid factor each. Three seronegative patients were diagnosed on minor salivary gland biopsy and a positive Schirmer's test. Out of 1486 nerve biopsies performed during the study period, features suggestive of vasculitis were seen in 145 patients (data collected from the Pathology department). On collating the other laboratory features, 10 were finally diagnosed as having SS. Nerve biopsy showed probable vasculitis (without fibrinoid necrosis) in 5 patients [Figure 2] and a demyelinating picture and axonopathy in 2 patients each. In 12 patients, the lip biopsy was done and 11 had findings suggestive of chronic lymphocytic sialadenitis, fulfilling the criteria required for the diagnosis of SS, while 1 had normal minor salivary glands. In all 21 patients, the treatment included intravenous methylprednisolone (1g/day infusion for 5 days) followed by oral steroids (prednisolone 0.5–1mg/kg wt/day). Simultaneously, a steroid sparing agent was started and oral steroid was tapered off over 3 months as the other immunosuppressants started acting. Maintenance immunosuppressants included methotrexate, azathioprine, or mycophonelate mofetil. 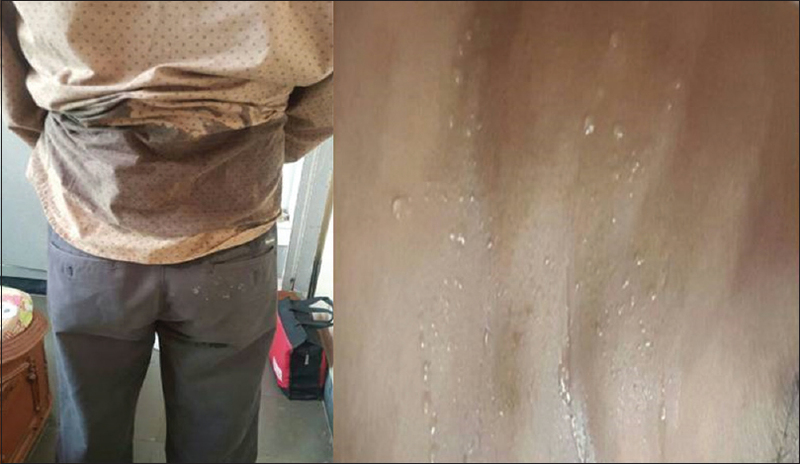 Two patients with ganglionopathy received intravenous immunoglobulin (2g/kg wt over 5 days) due to unresponsiveness to steroids. The improvement seen was more specific in them. The follow-up period was of approximately 2 years. SS is one of the most common exocrinopathies with characteristic dryness of eyes and mouth. SS was reported to be uncommon in India., Absence of Sicca features does not exclude SS as sicca symptoms occur only in 38% patients preceding the onset of neurologic features, while in 47% of patients, neurologic features antedate the sicca symptoms, often by up to 12 years. Hence, it becomes pertinent for the neurologist to be aware of the neuropathic phenotypes of SS. SS-associated neuropathy has a broad clinical spectrum including ganglionopathy or sensory neuronopathy, axonal sensory and sensorimotor polyneuropathy, multiple mononeuropathy, autonomic neuropathy, small-fiber neuropathies, and cranial neuropathies. The most characteristic neuropathy is the sensory ataxic variant with posterior column sensory dysfunction. The present study highlights the clinical presentation of primary SS patients with neuropathy. Data published in previous studies from India described the peripheral nervous system (PNS) and central nervous manifestations in SS.,, A large study involving 332 patients from India reported the predominant neuropathic pattern as mononeuritis multiplex. This is the only study that analyzed patients with peripheral manifestations of SS. The onset usually varies with the pattern of neuropathy; an acute or a subacute onset is observed more frequently in multiple mononeuropathy and multiple cranial neuropathies, whereas the disease progression is usually chronic in predominant sensory neuropathies. As in other connective tissue disorders, multiple mononeuropathies are well described in SS although they are relatively uncommon. Their reported incidence varies between 6–12%., Many studies reported a higher frequency of symmetric sensorimotor polyneuropathy and symmetric sensory neuropathy., In contrast to the previous studies, multiple mononeuropathy was the most common pattern in the present study. This could be explained by an evaluation bias for neuropathy. During evaluation of a patient with chronic sensory motor neuropathy, only a screening test for ANA is done, whereas a full serological workup is required for MNM. Patients with Sjogern's syndrome with vasculitic neuropathies are more likely to have full blown extraglandular manifestations.,, Vasculitis is the underlying mechanism of axonal multiple mononeuropathy and cranial neuropathies. Ganglionopathy with ganglionitis is the pathological hallmark of SS. The current study had 4 patients with a ganglionopathy. Patients have severe ataxia, areflexia without any weakness and suffer from severe functional disability., In general, SS neuronopathies are minimally responsive or intractable to high doses of corticosteroids and even potent immunosuppressive therapy. Although smaller case-series and anecdotal reports have described a dramatic success with intravenous immunoglobulin (IVIG),, some have shown only a minimal response. A similar observation was seen in the present cohort. Painful small fiber neuropathy may be the most common neuropathy in SS with a higher prevalence seen in specialized centres., Data from non-specialty cohorts of SS patients reveal a prevalence rate between 5% and 10%. The present study reports only 1 patient with this disorder. The symptoms and findings consistent with small-fiber dysfunction that disproportionately affect the proximal extremities, trunk, or face, frequently in a non-length dependant pattern, and which do not confirm to the dermatomal/peripheral nerve distribution should raise the possibility of SS. Autonomic symptoms may be encountered in up to 50% of SS patients. The clinical manifestations of autonomic neuropathy vary depending on the organs targeted and sympathetic versus parasympathetic control. Some, but not all the studies have demonstrated an objective parasympathetic dysfunction. Some authors have reported that the symptoms or signs of autonomic dysfunction were commonly seen in patients with sensory neuronopathy (57% had Adie's pupils, 40% had orthostatic hypotension, and 70% had abnormal sweating). Existence of autonomic neuropathy in patients with small-fiber symptoms may suggest a common mechanism of an underlying ganglionopathy. Symptomatic dysautonomia was seen in 3 patients with different patterns of neuropathy – focal hyperhydrosis plus painful small fiber neuropathy [Figure 3], postural hypotension plus MNM with vasculitis, and anisocoria with postural hypotension plus CIDP. These patients showed a good response to steroid therapy. Myopathy is rare in SS. We had only 1 patient who presented with episodic hypokalemic weakness with renal tubular acidosis at onset, and later developed persistent myopathy (due to vitamin deficiency) and neuropathy during the follow-up period. 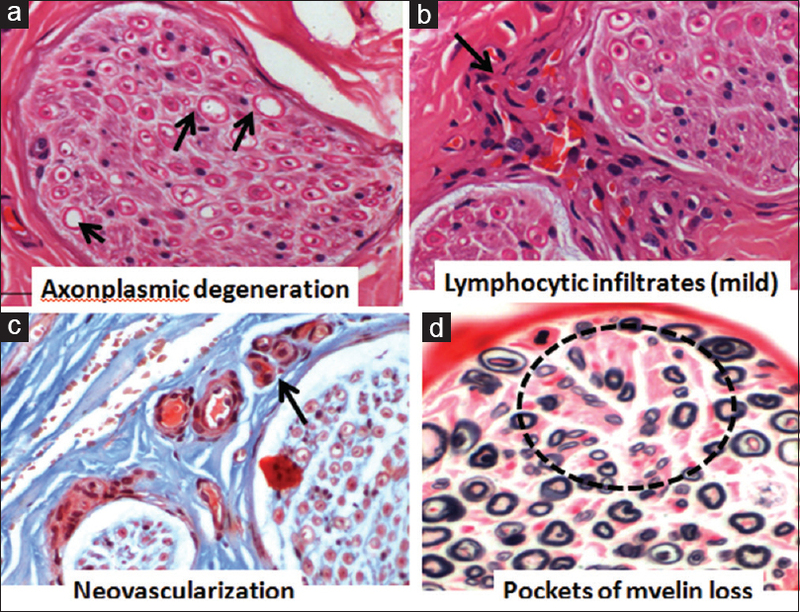 Inflammatory myopathies are uncommon peripheral manifestations of SS. Myopathy due to vitamin D deficiency needs exclusion. In general, the diagnostic and treatment approach is similar to that utilized in inflammatory myopathies not associated with SS. The pathophysiological basis of SS-associated neuropathy is still unclear. Dorsal root ganglionitis and peripheral nerve vasculitis have been observed on histological examination of biopsy and autopsy samples. A few studies have explored the fundamental role of humoral autoimmune mechanisms. Unlike the previous studies, our study had a high seropositivity [18 (85%) patients]. Seropositivity of Ro/Ss-A was seen in 76.2% and for La/SS-B antibodies was seen in 57% patients. Other studies have shown a seropositivity of anti-Ro/SSA in 33–74% of patients with SS, of anti-La/SS-B in 23–52% patients, and of antinuclear antibodies in 59–85% patients. The fallacy that a diagnosis is solely dependent on these autoantibodies is to be countered by the neurologists as they encounter neuro-Sjogren's without Sicca more often. Three patients who were seronegative met the criteria for Sjogren's syndrome with a positive lip biopsy and a positive Schirmer's test. The index of suspicion was high as 2 of them presented with ganglionopathy while 1 had a mononeuropathy multiplex pattern with sensorineural hearing loss at presentation. In the present study, a very high seropositivity could be explained based on a selection bias and the clinical practice methods. The methodology we adopted included preliminary evaluation of all the causative factors for neuropathy including the vasculitic profile. Patients who were found to be seropositive were included in the study and were diagnosed as SS if they met the other criteria. Minor salivary gland biopsy of the lip may be diagnostic in 37–75% of patients with SS-associated neuropathy., The lip biopsy was positive in 11 patients (52.4%), which is comparable to the published literature. A significant subset of patients may present with mild/no sicca symptoms with neurological manifestations. It is essential to identify these patients to diagnose SS. Evaluation for sicca symptoms, along with search of noninvasive, functional tests (i.e., Schirmer's evaluation <5 mm in 5 min; salivary flow) to establish glandular dysfunction is of utmost importance. In one series, Schirmer's test was positive in 56–89% of the patients with SS-associated neuropathies. Our study showed a similar result with Schirmer's positivity in 61.9% patients. Three seronegative patients in the present series had a positive Schirmer's test and the diagnosis was confirmed by lip biopsy. The limitations of the study include the retrospective nature of the study; and, that autonomic function tests and lip biopsy were not done in all patients. The strength of the study lies in it being a single-centre study. Our study showed that neuropathy is frequently the initial presentation of SS. The spectrum of neuropathies is varied and the most common phenotypic pattern is MNM followed by ganglionopathy/non-length dependant neuropathy, which is unique for SS. The pattern of neuropathy helps in arriving at a diagnosis of the syndrome. Serology is a very useful initial laboratory test and seronegativity should not exclude SS, if the clinical suspicion is very high. Confirmation of the Sicca syndrome by meticulous clinical evaluation and noninvasive functional tests followed by lip biopsy is essential, especially in seronegative patients. Mellgren SI, Göransson LG, Omdal R. Primary Sjogren's syndrome associated neuropathy, Can J Neurol Sci 2007;34:280-7. Koike H, SobueG. Sjogren's syndrome-associated neuropathy. Brain Nerve 2013;65:1333-42. Shiboski CH, Shiboski SC, Seror R, Criswell LA, Labetoulle M, Lietman TM, et al. 2016 American College of Rheumatology/European League Against Rheumatism classification criteria for primary Sjogren's syndrome: A consensus and data-driven methodology involving three international patient cohorts. Ann Rheum Dis 2017;76:9-16. Misra R, Hissaria P, Tandon V, Aggarwal A, Krishnani N, Dabadghao S. Primary Sjogren's syndrome: Rarity in India. J Assoc Physicians India 2003;51:859-62. Malaviya AN, Singh RR, Kapoor SK, Sharma A, Kumar A, Singh YN. Prevalence of rheumatic diseases in India. Results of a population survey. Indian Rheum Assoc 1994;2:13-7. Delalande S, de Seze J, Fauchais AL, Hachulla E, Stojkovic T, Ferriby D, et al. Neurologic manifestations in primary Sjögren syndrome: A study of 82 patients. Medicine (Baltimore) 2004;83:280-91. Yadav R, Krishnan P, Kulkarni GB, Yasha TC, Kumar MV, Nagraja D. Spectrum of Neuro-Sjogren's syndrome in a tertiary care center in south India. Ann Indian Acad Neurol 2011;14:111-5. Sandhya P, Jeyaseelan L, Scofield RH, Danda D. Clinical characteristics and outcome of primary Sjogren's syndrome: A large Asian Indian cohort. Open Rheumatol J 2015;9:36-45. Grant IA, Hunder GG, Homburger HA, Dyck PJ. Peripheral neuropathy associated with sicca complex. Neurology 1997;48:855-62. Mori K, Iijima M, Koike H, Hattori N, Tanaka F, Watanabe H, et al. The wide spectrum of clinical manifestations in Sjögren's syndrome-associated neuropathy. Brain 2005;128:2518-34. Kuntzer T, Antoine JC, Steck AJ. Clinical features and pathophysiological basis of sensory neuronopathies (ganglionopathies). Muscle Nerve 2004;30:255-68. O'Leary CP, Willison HJ. Autoimmune ataxic neuropathies (sensory ganglionopathies). Curr Opin Neurol 1997;10:366-70. Pascual J, Cid C, Berciano J. High-dose I. V. immunoglobulin for peripheral neuropathy associated with Sjogren's syndrome. Neurology 1998;51:650-1. Takahashi Y, Takata T, Hoshino M, Sakurai M, Kanazawa I. Benefit of IVIG for long-standing ataxic sensory neuronopathy with Sjogren's syndrome. IV immunoglobulin. Neurology 2003;60:503-5. Gono T, Kawaguchi Y, Katsumata Y, Takagi K, Tochimoto A, Baba S, et al. Clinical manifestations of neurological involvement in primary Sjögren's syndrome. Clin Rheumatol 2011;30:485-90. Lopate G, Pestronk A, Al-Lozi M, Lynch T, Florence J, Miller T, et al. Peripheral neuropathy in an outpatient cohort of patients with Sjogren's syndrome. Muscle Nerve 2006;33:672-6. Birnbaum J. Peripheral nervous system manifestations of Sjögren syndrome: Clinical patterns, diagnostic paradigms, etiopathogenesis, and therapeutic strategies. Neurologist 2010;16:287-97. Mandl T, Granberg V, Apelqvist J, Wollmer P, Manthorpe R, Jacobsson LT. Autonomic nervous symptoms in primary Sjögren's syndrome. Rheumatology (Oxford) 2008;47:914-9. Mandl T, Wollmer P, Manthorpe R, Jacobsson LT. Autonomic and orthostatic dysfunction in primary Sjögren's syndrome. J Rheumatol. 2007;34:1869-74. Barendregt PJ, Tulen JH, van den Meiracker AH, Markusse HM. Spectral analysis of heart rate and blood pressure variability in primary Sjögren's syndrome. Ann Rheum Dis 2002;61:232-6. Mori K, Koike H, Misu K, Hattori N, Ichimura M, Sobue G. Spinal cord magnetic resonance imaging demonstrates sensory neuronal involvement and clinical severity in neuronopathy associated with Sjogren's syndrome. J Neurol Neurosurg Psychiatry 2001;71:488-92. Sakakibara R, Hirano S, Asahina M, Sawai S, Nemoto Y, Hiraga A, et al. Primary Sjogren's syndrome presenting with generalized autonomic failure. Eur J Neurol 2004;11:635-8. Lui NL, See SJ, Thumboo J. A rare cause of reversible unilateral third nerve palsy. J Neurol Sci 2008;275:188-90. Chu K, Kang DW, Song YW, Yoon BW. Trochlear nerve palsy in Sjogren's syndrome. J Neurol Sci 2000;177:157-9. Goransson LG, Herigstad A, Tjensvoll AB, Harboe E, Mellgren SI, Omdal R. Peripheral neuropathy in primary Sjogren syndrome: A population-based study. Arch Neurol 2006;63:1612-5. Rigamonti A, Lauria G, Balgera R, Agostoni E. Subacute inflammatory polyradiculopathy associated with Sjogren's syndrome. Muscle Nerve 2009;39:855-7. PouSerradell A, Vinas Gaya J. 3 cases of rare peripheral neuropathies associated with primary Gougerot-Sjogren syndrome. Rev Neurol (Paris) 1993;149:481-4. Terrier B, Lacroix C, Guillevin L, Hatron PY, Dhote R, Maillot F, et al. Diagnostic and prognostic relevance of neuromuscular biopsy in primary Sjogren's syndrome-related neuropathy. Arthritis Rheum 2007;57:1520-9. Periquet MI, Novak V, Collins MP, Nagaraja HN, Erdem S, Nash SM, et al. Painful sensory neuropathy: Prospective evaluation using skin biopsy. Neurology. 1999;53:1641–1647. Lacomis D. Small-fiber neuropathy. Muscle Nerve 2002;26:173-88. Bournia VK, Vlachoyiannopoulos PG. Subgroups of Sjögren syndrome patients according to serological profiles. J Autoimmun 2012;39:15-26. Gorson KC, Ropper AH. Positive salivary gland biopsy, Sjögren syndrome, and neuropathy: Clinical implications. Muscle Nerve 2003;28:553-60.